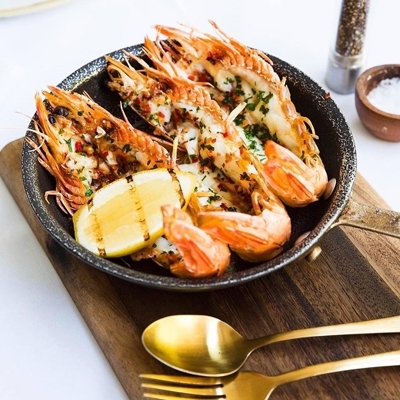 Gourmet and trendy, street food these days is not just a passing fashion – it is a culinary style of its own, eagerly embraced by foodies Australia-wide. While the origins of street food may be salted in Asian hawkers and market vendors’ recipes for fare on a stick, it has been reinvented in innovative ways to encompass food trucks, snack-style restaurant options and fine dining interpretations. Who would believe Ben Shewry would be serving wallaby souvlaki from the back courtyard of his Attica restaurant in Melbourne? Even restaurants in the world’s top 20 are hooked on the street food phenomenon… read on to find a fix near you. Lane 198's pork belly bao. 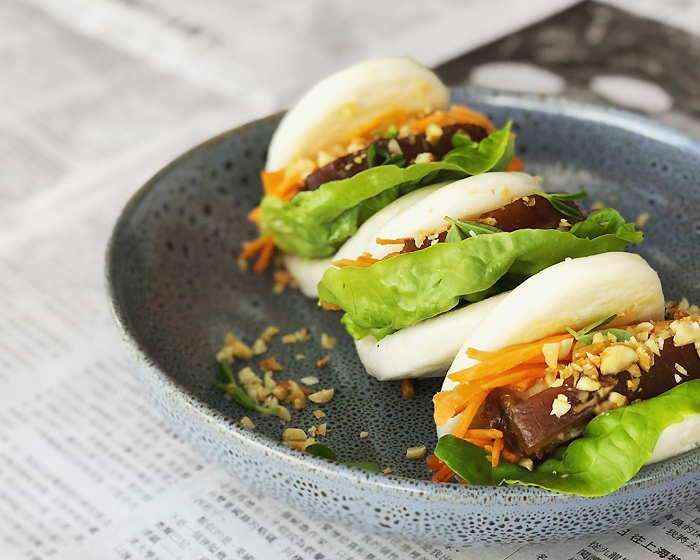 From cheeseburger spring rolls to braised pork belly bao, Lane 198 on Victoria Road in Gladesville expertly fuses Mod Oz fare with an injection of South-east Asia. Creating a sensory overload to excite the taste buds and keep guests returning for more, chill out in style in a vibe of dark wood, glowing downlights and polished concrete floors. Perhaps start your street food journey with baby gem lettuce cups with housemade pork mince filling and crispy, crunchy coconut prawns; before moving onto more substantial plates of deep-fried soft-shell crab with chilli mayonnaise and caramelised slow-cooked braised pork, snow peas and soft-boiled egg. Green tea and steamed treats are on the menu at Red Ginger emporium, on Jonson Street in Byron Bay. Delighting all the senses, Red Ginger grew out of a love of Asian food and culture and now delivers delicious dumplings along with a full range of Asian groceries for the home cook, decorative homewares and furniture. 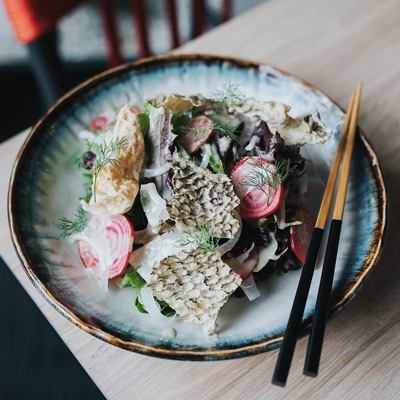 Like stepping into the laneways of old Shanghai, the sights, sounds, aromas and tastes of Red Ginger lure guests to linger over a steaming cup of tea, while delving into Chinese BBQ pork steamed buns, scallop and prawn dumplings and vegetarian gyoza with bok choy and shiitake mushrooms. Finish sweetly with a fluffy steamed bun, filled with custard. 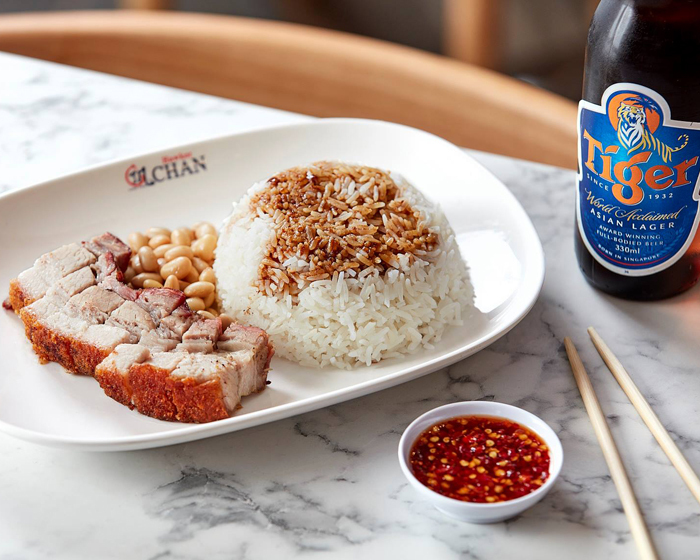 Hawker Chan's roasted pork with rice. Once through the doors of Hanoi Mee Kitchen & Bar in Port Melbourne, find yourself on the streets of Vietnam. This Asian fusion restaurant on Rouse Street promises an explosion of exotic flavours as guests settle into booth seating beneath picturesque wall murals, with worn brick and a bright neon sign adding to the happily, buzzing vibe. Wrap your hands around a black pepper sticky pork belly bun with cucumber, spring onion and chilli, or Vietnamese crispy fried chicken ribs with sriracha chilli mayonnaise; while calamari, crab and shrimp spring rolls may tempt lighter tastes along with taro, sweet potato, corn and chestnut steamed dumplings. Bringing the world’s cheapest Michelin-star meal Down Under, Hawker Chan on Lonsdale Street in Melbourne’s city centre , satisfies cravings for succulent Cantonese chicken. Chef Chan has been perfecting his recipes for almost 30 years and while he won’t spill any of his secrets, diners can expect melt-in-the-mouth dishes at this modern eatery. Pick up your chopsticks and delve into char siew pork with rice noodles and a side of seasonal vegetables, or perhaps Thai-style tofu with soya bean sprouts and noodles; before contemplating a plate of signature soy marinated chicken with aromatics of Chinese angelica root, cloves, coriander seed and star anise. Brisbane foodies get their souvlaki fix from That Greek Truck, as it trundles around the city serving up authentic fare like Yia- yia makes. Probably one of the first street food thoughts to pop into starving diners’ heads, souvlaki is all about mouth-watering meat, marinated in olive oil, salt, pepper and oregano, then barbequed. From various venues, markets and festivals, this food truck dishes up temptations such as deep-fried halloumi, drizzled with housemade sweet mustard mayo; along with warm, toasted lamb and chicken souvlaki pita wraps with lettuce, onion and tomato, topped with tzatziki garlic yoghurt sauce. Vegetarians aren’t forgotten with a grilled eggplant, capsicum, zucchini and mushroom option. 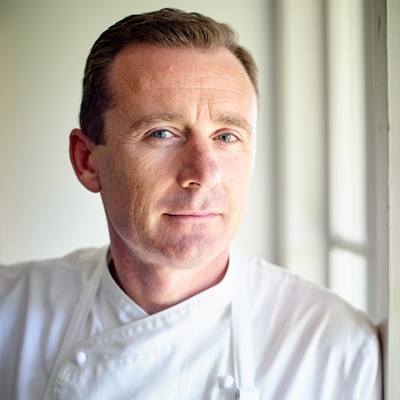 For flavours that transcend the norm, stop into IzzyChai on Weyba Road in Noosaville. Modern Asian fare with zing is on the menu as guests relax on the deck to enjoy lagoon views and a light breeze , while sipping a drink of choice. Kick start your street food journey with Filipino-style spring rolls, filled with minced pork, carrots, beans and onions, served with housemade dipping sauce; before teriyaki marinated and deep-fried chicken wings stuffed with cashews, shallots and Chinese sausage. Those who like it hot may opt for dynamite ham and cheese filled jalapenos, wrapped in rice pastry and deep fried. Street food isn’t just about Asian fare, Abbiocco Food Truck brings Italian food with attitude to venues around South-east Queensland. 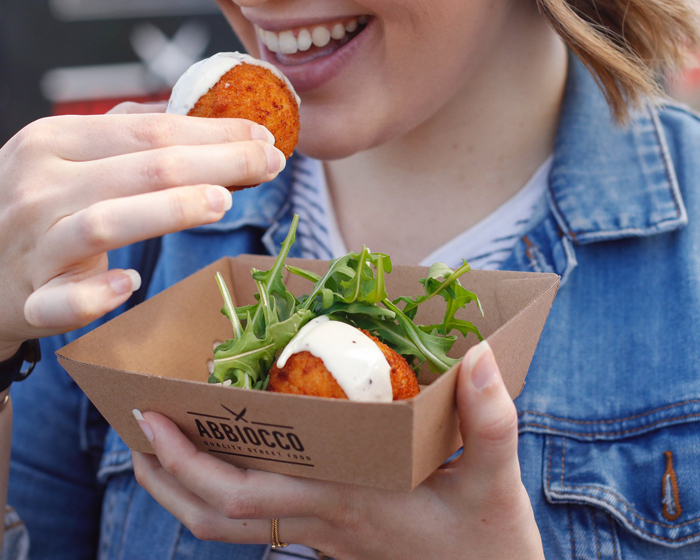 The product of a creatively frustrated Chef, Abbiocco is all about taking the joy of food to the streets, meeting people and sharing traditional Italian food, done their way; such as bacon and mozzarella risotto balls, served with rocket and housemade aioli. 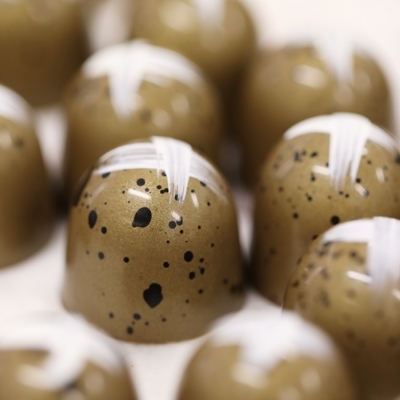 Grab a plate of pumpkin and spinach fried ravioli pieces, tomato chutney and rocket, or perhaps crispy grilled polenta and Parmesan cheese wedges with housemade salsa verde; before a traditional dessert of tiramisu – layers of sponge soaked in coffee and Tia Maria, topped with powdered chocolate and mascarpone cream. 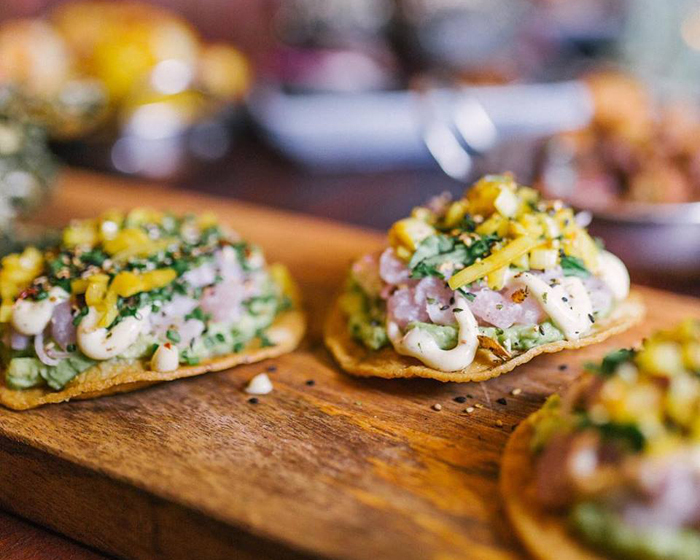 Eat no Evil's fish ceviche tostadas. Taking street food to a new level, Fremantle food truck Eat No Evil Street Food and Catering is wowing locals with art on a plate. 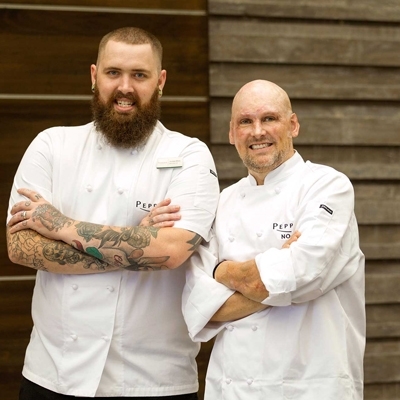 With a fun, coastal attitude and vibrant flavours, this high-end mobile restaurant uses sustainable, native and local produce to create dishes to inspire and entice foodies to follow their journey around Perth’s suburbs. Expect plates such as ceviche snapper tostadas, green apple, coconut and pepperberry, alongside kombu beef sliders with tasty cheese, pickles and miso mustard sauce; or salivate over twice-cooked lamb ribs, beetroot hummus and chimichurri and cheeseburger spring rolls. For a sweet treat, try raw coconut banoffee pie. Embracing food sold in local South-east Asian street markets, Joe’s Wine & Dine on Rokeby Road in Subiaco, aims to bridge the gap between people of all cultures. Joe’s exudes the ideal vibe for winding down after work with a cocktail bar, live music and tapas-style fare, served in a moody ambiance of dark furniture, chandelier lighting and polished floors. Wrap your hands around a pulled lamb vindaloo bao with Asian slaw, or a honey sriracha grilled chicken brioche slider with caramelised onions; perhaps opt to share small plates such as togarashi squid, seaweed and pickled ginger, alongside flat bread spread with sweet potato puree, blue cheese, rocket, balsamic and prosciutto. Lolo and Lola's Spanish bread, BBQ skewers and fried rice. 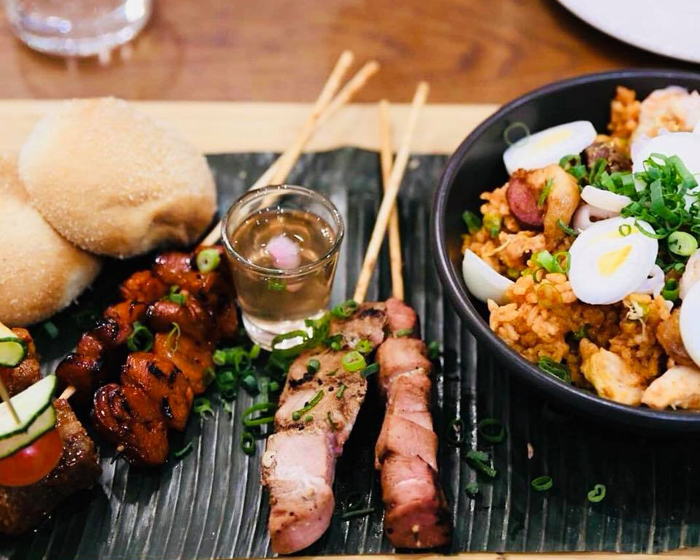 With a name honouring grandparents in Filipino, Watson eatery Lolo and Lola serves fare from the homeland from a menu celebrating rich culture, history and flavours. Relax in style indoors or out, while tucking into all-time street food favourites such as grilled chicken skewers with banana and barbeque marinade and spiced vinegar dip, or a crispy fried pork belly bagnet. From a weekly changing selection, find plates like tap ni Lolo – sautéed Filipino beef jerky with garlic, soy vinegar marinade – and fried chicken drumsticks with housemade gravy; while sweet lovers won’t go past crème caramel and salted peanut meringue. 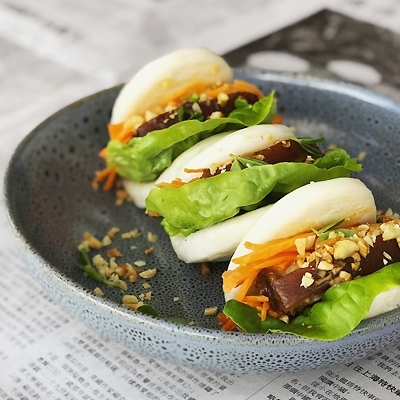 Traditional Chinese street food with an unexpected modern twist awaits Canberra diners at Momoda on Northbourne Avenue. Meaning ‘kiss, kiss’ in Chinese slang, this unconventional eating house and bar boasts a punchy menu with every mouthful created to taste, love and share, alongside a cocktail of choice. 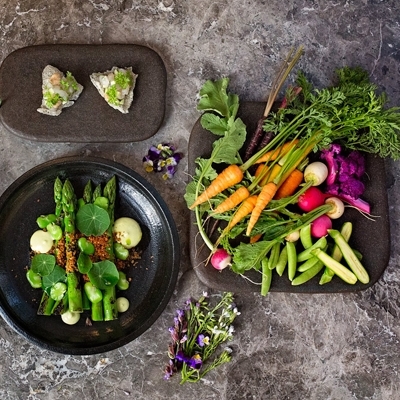 Sit back and snack on small plates such as Mongolian kangaroo spring rolls, with Sichuan chilli salt, wombok and ginger salad; or Peking duck gua-bao, with fennel, Lebanese cucumber, shredded leek and plum sauce. Perhaps opt for tasty confit mud carp croquettes with Manchego coriander, alfalfa, water chestnut and squid ink reduction.